If you want to get strong, fit, and into great shape, medicine balls are a great way to train. They combine weight training with conditioning and provide a fantastic core workout. How can they get better? Well, you can start by putting handles on them! Today we’re going to be discussing medicine balls with handles: why they’re special, what you can use them for, and some popular products. Stick around if you’re looking for a better deal on a medicine ball with handles. 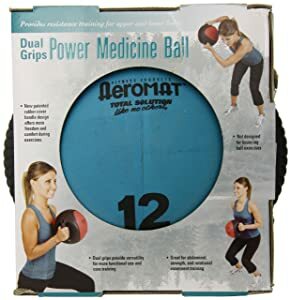 Why use medicine ball with handles? 1. Production quality is key. 3. Finish: soft or hard? This product provides all the basics we’re looking for: a variety of weight options. Ranging from 6 to 20lbs, Titan has options for almost anyone. 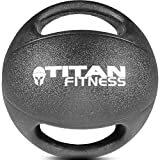 You’ll need to be seriously strong to find any issues with the weight-range for this product if you’re using them for core or conditioning work. The handles for this product are moulded into the sides and have no real seams, which provides a level of stability and reliability we really like. this also means you’re not likely to run into any problems with the handles coming away from the weight. Problems raised with this product all tend to center on the smell, which is distinct with new products. The only other concerns are with quality assurance: a few sub-standard products have been sent before. We think this is a pretty good standard to set but would like to see a more thorough quality-assurance approach to maintain these standards. 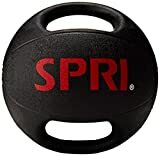 With a similar design and range to the Titan fitness medicine ball, SPRI are on the right track. Their medicine ball does provide a harder finish, however, which comes with benefits and disadvantages. It’s more rigid, which reduces weight transfer during exercise. This can be useful, but it depends on the exercise. On the downside, the finish is more liable to take lasting damage if dropped or hit. This can be a problem if you’re keeping the ball lying around your home gym, or just don’t want to deal with the possibility of lasting damage. The smell of this product tends to be accompanied by a greasy or flaky finish. These represent a minority of the customers but are significant enough to be worth considering. Combining the “toxic” chemical smell with the hardened – but poorer – finish, we see no reason to choose SPRI over the titan fitness alternative! 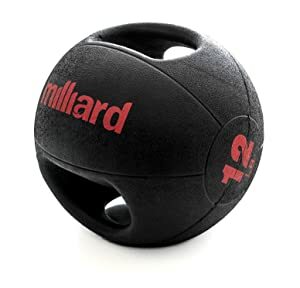 Milliard’s medicine balls come in a standard 12lbs. This isn’t a problem – unless you want any other weight! The lack of range here is a concern when we compare the product to competitors. 12lbs is too heavy for some, far too light for others. This really limits the appeal of this product. It also seems, from customer reviews, that the rest of the weights were removed due to poor production quality and a “flaccid” or “limp” finish. This was the result of having too much space in the product, resulting in deflation. This is a real concern, with a significant portion of customers reporting serious problems. This could be deflation (which should never happen in a medicine ball! ), the same toxic smell we’ve seen with SPRI, and other problems with the finish. Once again, the risk of getting a poor-quality product really outweighs the benefits of choosing this brand. 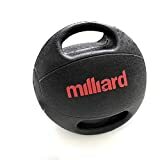 All manufacturers have a risk of poor products, but Milliard seems to be a 1/10 risk of a bunk medicine ball! This is the product we’ve been hoping for! 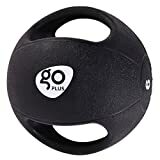 The GoPlus medicine ball combines a number of very simple, effective benefits to produce the best product on this list so far. It begins with a hard-wearing, non-disgusting, environmentally-friendly rubber finish. This means heavy-duty, solid outer without any of the concerns for slime, chipping, or damage associated with other products. The range is also only slightly narrower than others on this list. It doesn’t provide a 20lb version, capping out at 16lbs, but caters to lighter workouts all the way down to 6lbs. The only concerns we’ve seen raised about this product are about the stability of the handles. The 16lbs version does come with a little more sway than we’d like, but this is very rare and all other customers suggest this is a fantastic product. The design of this product is unique on this list – it doesn’t opt for a smooth, spherical shape. The idea is to improve ergometry, but the result is a bit ugly. The range on this ball is good – from 6 to 30lbs – but the costs are huge compared to others on this list. We’re not sure what they’re making these balls out of, but they’re definitely not justifying the costs! The handles and performance of these medicine balls is good. There are no real concerns for stability, and the ergometric design seems to be great for grip. However, the cost and limited production of these medicine balls are a real concern. While the quality may be slightly better than GoPlus, we don’t think it’s over 200% better! 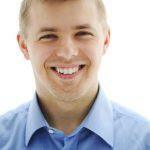 Finding the right product is important and, if money is no object, this might be for you. However, we’re inclined to save our cash and this product’s price tag is very off-putting! Great range of weights from 6 to 30lbs. By far the largest choice. Why do handles change the game with medicine balls? After all, they’re just another way of holding the weight, right? Only sort of! The way you hold a medicine ball changes everything from the muscles it trains to your whole center of gravity. The challenge of different grips is a challenge of different movement. Everything upwards from the grip changes in order to deal with a different grip. The alternative benefit is a totally different set of exercise you couldn’t do before becoming available. If you’re familiar with fitness, you’ll know that exercise variety and choice are essential for the best results. The handles are a small feature if you don’t know what you’re doing. However, once you try the new exercises they offer, you’ll realize that they’re a game-changer! 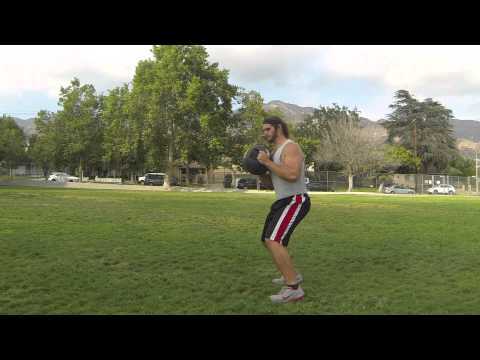 There are a few key factors you want to look for when dealing with a medicine ball. These apply here – and the handled version comes with its own challenges. Medicine balls are useful for their variety and they’re going to take a lot of punishment. You want a product that isn’t going to fall apart! If you’re buying for a home gym, you want a product that is going to stand up to years – even decades – of intense exercise. A poor-quality med ball is a bad investment and you’ll need to buy again. Try to focus on the finish of the outer and make sure that you’re getting a product that will last. This means extra attention to the materials used to finish the medicine ball and strong, reliable seams. The quality of the handles and their construction is also going to be important since, without the handles, this product loses its key advantage! This is something we see with many of the products on our list. This comes as a risk with almost any rubber finish, but a manufacturer should make sure this isn’t how the product arrives! The smell of some of these products really limits their use, stinks out any home gym, and can lead to serious nausea. The brands that check for this show a serious commitment to your satisfaction – and they deserve the praise for it! The finish of a medicine ball doesn’t need to be hard, just hard-wearing. Softer, rubberized finishes reduce long-term damage or the risk of chipping. This only works if they’re full. Inflated medicine balls are a bad use of your cash as they introduce increased risk of deforming. We prefer the soft finish on a full, no-air medicine ball. This produces the most reliable, effective product for continued use. This is especially important if you plan on throwing your medicine ball (something that is often used in discus and shot put training). The point of this product is to incorporate new exercises to your training routine. There are a few key exercises and variations you should focus on. You should be using a double-handed weighted ball for your core wherever possible. Medicine balls and slam balls aren’t the same, but their goal is to work your core in new ways. This is why we love the dual handle medicine ball. The best way to do this is to use it for a few types of non-standard core work: rotational and asymmetrical. Medicine balls with handles are great for side bends, for example, which you couldn’t perform as effectively without the handles. Equally, you can use them for Russian twists in a far more effective fashion than their handle-less counterpart. Using your core for more than crunches – working rotation and lateral styles of core training – is key for better health and performance. The medicine ball with handles is perfect for this! You get strong with barbells, you get fit with objects. This is one of the most important principles of effective training in Strongman. It’s a great way to improve your overall fitness in a way that builds athleticism and core. Using weighted objects introduces stability challenges, increased core training, and provides a great way to increase your fitness under load. This is important for almost all sports and supports better connective tissue health. 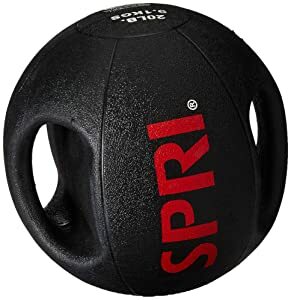 Medicine balls with handles are perfect for conditioning work – they can be used like a regular medicine ball, but offer more options for carries, lifts, and core work (as mentioned above). Try using the medicine ball with rotating lunges, overhead walks, a ground-to-overhead, or even the aptly-named death march! This is one of the most important and under-rated aspects of athletic training. If you want well-rounded fitness, you need to learn to control your core and single-leg or single-arm movements. A medicine ball is perfect for training these lighter, coordination exercises. Single-leg contralateral deadlifts sound fancy, but they’re the perfect exercise for hip and core control. 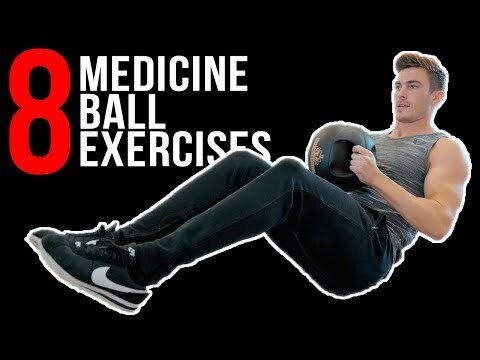 The medicine ball with handles is unquestionably one of the best ways of training this type of movement. Handles might seem like an easy addition, but they unlock a world of single-arm exercises. Good luck doing them with a regular medicine ball! What we see with the dual handle medicine ball is a small change that opens up dozens of new possibilities. This small design change makes a medicine ball even more versatile – offering up a new challenge and new opportunities. The real value of this kind of product is how you integrate it. It might just be a weighted ball with handles, but you can make the most of that with some clever exercise selection! Our favorite product from this line-up is GoPlus’ dual grip medicine ball. It provides the best balance of function and value, with a great customer reception. Overall, they hit the right balance and really nail the basics. 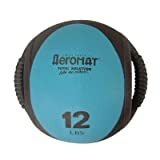 If you’ve got all the money in the world, then the Aeromat medicine ball might be a good choice. We can’t honestly recommend a product this expensive when there are good alternatives, but it depends on your budget/needs! 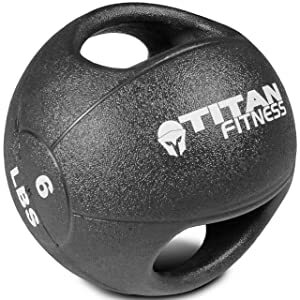 This is a purchase that can vastly improve your fitness, core strength, and workouts at relatively little expense. It’s a fantastic investment in yourself and producing a well-rounded, athletic physique!